A person's stuttering may vary from day to day and situation to situation. Certain conditions like talking on the phone, talking to strangers, public speaking, feeling rushed, or being very tired may increase the severity of stuttering. 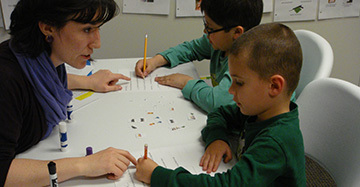 The speech-language pathologist (SLP) may use a variety of formal and informal tests to evaluate the client's fluency. She will measure how often and what types of dysfluencies and secondary behaviors occur in different speech tasks and situations. She will also watch for coping strategies the client might be using (e.g., avoiding certain words, changing rate) and the reactions of the client to the dysfluencies. She will take a thorough history and may interview the client and/or family about when and how the issue developed, stuttering behaviors at home, factors in the environment, and the impact of stuttering on communication, emotions, and daily activities. Testing of other speech and language skills may also be completed. In very young children, the SLP will try to predict the risk of continued stuttering in order to decide if therapy should be started. She may opt to begin treatment, or may give the family tips about dealing with the stuttering and just occasionally follow up to monitor the child's fluency. With older children and adults, the SLP will want to assess both the severity of the disorder and its impact on the client's life, to create an appropriate treatment plan. Treatment for stuttering is designed to promote more fluent speech and to lessen the negative effects of stuttering on overall communication and participation in daily activities. The SLP may teach strategies for improving fluency, such as slowing rate of speech, using less tension in the voice and mouth movements, controlling breathing, and easing out of moments of stuttering. These strategies are practiced in gradually more complex utterances and more difficult situations. The SLP will also educate the client about stuttering so that he understands it better, and work to desensitize him to his stuttering and minimize negative reactions. In young (preschool) children, therapy may simply focus on teaching parents to model slow, smooth speech and provide feedback to children about their fluency.